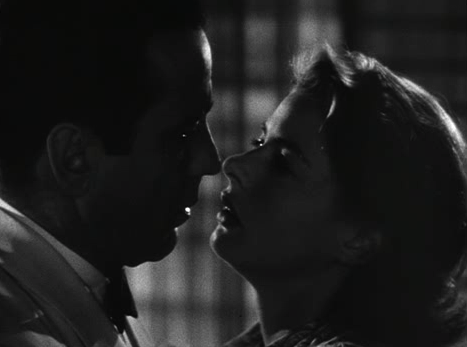 In this ten-part series I study the screenplay of ‘Casablanca’ by breaking it down to its several aspects. Click here and read from down upward for the entire series. Story: Laszlo offers to buy the letters of transit from Rick but Rick blatantly refuses. He suggests Laszlo ask his wife the reason behind this. As Laszlo steps out of his office, he hears some Germans singing a popular anthem. He arouses others to sing the French National Anthem that drowns the Germans. Ilsa is filled with pride seeing Laszlo do this and Strasser is worried. He orders Renault to the get the café shut. As Renault implements the orders, against Rick’s protests, Strasser walks to Ilsa and threatens her. He says that unless Laszlo returns to occupied France, he will either be sent to a concentration camp or murdered. Ilsa and Laszlo leave the café and reach their hotel room. He asks Ilsa about Rick. Before she could say anything, he gently implies that he understands something must have happened between them in Paris when he was in a concentration camp. He still trusts her and loves her and needs no explanation. He then rushes to attend the underground meeting. Rick knows that his café will be shut for the next few weeks, but he still wants to keep the employees on salary. When he reaches his room, he finds Ilsa waiting there. She tries to convince him to get the letters, but he would not budge. She then points a gun at him. When he provokes her to shoot, she cannot. She confesses how much she still loved him. He takes her in his arms and they kiss passionately. Pg 89: Rick’s staff and Renault discuss with him about the generosity he just displayed. Pg 90-91: Laszlo tries to get the letters from Rick but fails. Pg 92-95: The battle between the anthems. Renault gets the Café shut. Strasser threatens Ilsa. Pg 96-98: Laszlo and Ilsa talk about Rick in their hotel room before Laszlo leaves for the underground meeting. Pg 99: Rick informs Carl that the employees will remain on payroll despite the café being shut. Carl leaves for the underground meeting. Pg 100-102: Rick finds Ilsa in his room. And the conversation that follows. Structure: After the brakes on the narrative in the seventh part, this eighth part focuses only on the main plot and takes it significantly ahead. The entire political situation has now zeroed down to the triangular relationship of Rick, Ilsa and Laszlo. And at this point we empathize with each one of them. Strasser’s threat to Ilsa, and Rick’s refusal to help Laszlo has forced Ilsa to drive the narrative on her own shoulders. Screenwriting books keep talking about ‘Rising Tension’ and ‘Thickening of Action’. This segment is a great example of that, apart from a masterful command over the rhythm. Rick: Our admiration for him as a person keeps growing. He is there for everyone who needs him. As Renault says, he is a sentimentalist at heart, a good-natures one. And it’s ironical that this guy blatantly refuses to help Laszlo. Why? Because of the passions involved, the matters of the heart. This irony in his character is wonderful. Subconsciously we also want him to overcome this conflict. Also, notice that when Carl tries to tell him that he is going to attend the underground meeting, Rick asks Carl not to tell him anything. He is rational, and careful. Ilsa: We admire her so much now, for the way she is proud for her husband and cares for him, for how devoted she is to him, and for her courage and determination to go to Rick with a revolver for her husband. And then we see how vulnerable she is when it comes to Rick. She is still in love with him. Has always been. Laszlo: And we admire this man as well. More than ever. He so strongly believes in his cause. He so easily manages to lead the sentiments of his people while making them sing their anthem. He confesses to his wife that he is scared, but still goes to attend the underground meeting at night, because he wants to do all that he can. But most importantly, he surprises us with his understanding of the situation between his wife and Rick. For this kind, brave and understanding man, his cause is so important that anything else cannot matter much. Sub-plots: Yvonne’s sub-plot goes through a very understated but beautiful resolution. With her patriotism aroused, it seems she will not allow German officers to woo her, at least for now. Cause and Effect: Read this wonderful pattern of causality. German anthem – Laszlo provokes his men to sing the French anthem – Strasser witnesses this – asks Renault to get the café shut (this shutting down will contribute to Rick’s decision in the climax) and threatens Ilsa – she gets to know about Rick’s refusal to Laszlo – she goes to meet Rick. Let the characters drive the plot: Just observe the actions and decisions of all the characters in this segment and see how the plot is being totally driven by them and not by chance. Add a sense of urgency to make conversational scenes more interesting: The presence of the stalker below Laszo's hotel window and his need to leave for the underground meeting soon creates a sense of urgency in which he and Ilsa talk about Rick. Thus adding such a powerful dramatic tension to it. Tease the audience and let them anticipate: While leaving the café Ilsa asks Laszlo what happened with Rick. “We’ll discuss it later” comes the reply. We stay with them, and they talk about other things before they come to Rick’s suggestion that Laszlo should ask his wife. This delay has teased us and forced us to anticipate some great drama between Laszlo and Ilsa. Reverse Expectations: There is no high-tension drama over Rick between Ilsa and Laszlo. He is so understanding that it surprises us. The scene actually gives us more than we could have imagined. And it also underlines that for Laszlo, the cause is more important than anything else. Foreshadowing: By showing that Carl is leaving for the underground meeting as well, the writers have made sure that in the next part when Carl returns with Laszlo while Rick is talking to Ilsa does not look forced or chance-driven. Time Lapse: Carl leaves for the meeting. Rick goes upstairs to find Ilsa. They talk. Carl and Laszlo return, escaping the police. In order to logically give Carl sufficient time for this, there is a time-transition in the middle of Rick's scene with Ilsa. Themes: With “Wacht am Rhein” (a popular German anthem) and the “Marseillaise” (French National Anthem) battling out in this part, the political theme of the film gets dramatically colorful. Also, we are reminded yet again that Casablanca is representing the entire world. Also, the theme of Casablanca being a “prison” is reiterated again as we see Ilsa and Laszlo talk in dark, behind curtains, peeping and exiting stealthily. Standout scene: The final scene of this segment when Ilsa confronts Rick for the letters and ends up confessing her love for him is one of the best written scenes in the history of cinema. One note must be made how a logical loophole has been covered as soon as the scene begins. When Rick spots Ilsa in his room, he asks her “How did you get in?” She replies “The stairs from the street.” In ten words, two short sentences, this logical explanation is given to the audience. It’s not taken for granted that the audience will not mind Ilsa appearing in his room out of nowhere. On the other hand, the drama has not been compromised by making her enter normally. This little explanation is the best way to solve it. What is the audience expecting: It is getting so intense! Rick and Ilsa still love each other passionately. And we admire both of them and Laszlo so much more than ever. We really do not know where this story is going, but want the best resolution for all three of them. With eighty per cent of the film over, we are so engrossed, curious, and emotionally involved.